Dr. Forrest C. Shaklee, Sr. came out of the heart of America, born in 1894 on a farm in Carlisle, Iowa. He gave America his heart, his mind and a philosophy that still inspires the lives of millions. Through his philosophy and the company he started, he changed the lives, the health, the fortunes of people throughout the world. Using the knowledge he gathered from a lifetime of studying the importance of nutrition in building health, Dr. Shaklee founded Shaklee Products in 1956 with his sons Forrest, Jr., and Raleigh to produce and sell nutritional supplements. 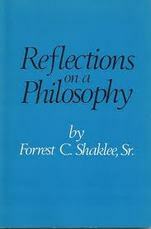 The company sales plan was firmly based on the Golden Rule and on Dr. Shaklee's philosophy of "Thoughtsmanship." The direction of medicine after W.W.II had begun to shift from treating and curing disease toward health maintenance, a trend that continues today. Recognition of the importance of nutrition in good health had been recognized more clearly during this time, and nutrition was becoming a more scientific discipline. In this atmosphere this tiny nutritional supplements company took its first steps. From its modest beginnings in 1956, through it's explosive growth during the 1970's, to present day, the corporation remains guided by Dr. Shaklee's founding philosophy of the Golden Rule and In Harmony with Nature®. Dr. Shaklee collected many personal honors in his career, including special recognition from the California Secretary of State. In 1975, he stepped down from his position as President and Chairman of the Board of Shaklee Corporation and accepted the position of Chairman Emeritus of Shaklee Corporation, a position he retained until his death in 1985 at the age of 91. In recognition of his many achievements, Dr. Shaklee's name has appeared in such publications as Who's Who in the West, Who's Who in America, Who's Who in the World and the International Register of Profiles. Today, Shaklee stands as a monument to the vision, the genius and the conviction of Dr. Shaklee. Through his vision he has enriched the lives and improved the health of thousands of people throughout the world. His philosophy of "Thoughtsmanship" is as valid and effective now as when it was first published. The corporation stands today as a living tribute to a visionary leader with an extraordinary philosophy.
" 10 Rules for Happiness and Contentment". This timeless piece offers Dr. Forrest C. Shaklee's inspirational ideas about pursuing your dreams, encouragement and success in his own words. A joy to read anytime! built his life and the company that bears his name.